Several of the topics discussed below can and should be addressed in the design and construction of wood furniture. To mitigate their effects, one can incorporate Best Traditional Woodworking Practices. If furniture is to last more than a few years, and doors and drawers are to work as well in a decade as when new, the furniture should be built using those Best Traditional Woodworking Practices. These are not strictly hand tood methods and procedures, and all can more or less be replicated using power machinery. But build using crooked lumber, overly wet or dry wood, careless board matches, cross grain construction, and screws rather than mortise and tenon and dovetail joinery and the piece will be shorter lived, less attractive, and less functional. The following is taken primarily from Understanding Wood: A Craftsman's Guide To Wood Technology (2000) by R. Bruce Hoadley, and also from Encyclopedia of Furniture Making (1987) by Earnest Joyce, revised by Alan Peters. The former especially is highly recommended for anyone wishing to better understand and use wood. In non-tropical areas of the world, trees grow in the spring and summer, and are dormant in the winter. There is rapid growth of new cells in the first part of the growing season, and slower growth during the remainder of the growing season. The combination of early- and late-wood growth produce an annual ring. For many trees, the earlywood growth is lighter colored and less dense (softer) than the latewood growth. For some trees such as basswood it is difficult to distinguish between the earlywood and latewood. From the outside to the center, the layers of a tree trunk are the bark, bast, sapwood, heartwood, and pith. The outermost part of a tree trunk is the bark. This dead tissue shields the tree against injury and rapid changes in temperature and humidity, and protects the vital layers underneath it. The bast is the only part of the tree trunk that conveys food from the leaves to the roots. The cambium layer, one cell thick, creates new bast and sapwood. Sapwood is recently formed cells that transport water (sap) and nutrients from the roots to the leaves. Characteristically, sapwood is almost white, cream, or tan. In some species, the layer of sapwood is relatively narrow. On average, black locust sapwood is only 2-3 annual growth rings thick; black cherry sapwood 10-12 annual growth rings thick; and black walnut sapwood 10-20 annual growth rings thick. In contrast, sugar maple sapwood is 30-40 annual growth rings thick, and black tupelo sapwood 80-100 annual growth rings thick. These are averages, and when heavily shaded by taller neighboring trees the sapwood layer may be much narrower than normal because it has fewer leaves. Each year the tree is adding sapwood. Eventually it has more wood than needed for transporting sap. The excess sapwood, nearest the center of the tree, is converted to heartwood. Heartwood often is darker than the adjoining sapwood due to chemical compounds called extractives that are deposited by the tree. These extractives also often make the heartwood much more decay resistant than the sapwood. Black cherry, red cedar, redwood, and black walnut all have prominent heartwood due to the color change caused by their extractives. The following picture shows five white ash boards in an elliptical tabletop. Sapwood and heartwood are easily distinguished in each board. The innermost layer of the tree trunk, the pith, is the remnant of the original sapling. It has no value to woodworkers and usually cut at the sawmill from rough lumber. With some species of wood, such as cherry and walnut, the heartwood is the preferred layer for furniture. With white ash, some people may find the creamy sapwood more attractive than the brown heartwood. The difference in density between early- and latewood can cause problems when preparing some woods for finishing. A random orbit sander with a soft and perhaps even with a medium backing pad can remove more of the softer earlywood than the harder latewood, leaving a rippled surface. Hand planing removes evenly the early- and latewood, avoiding this problem. The growth rings are always drawn as equally spaced coincentric circles. Actual growth rings can vary in width from year to year, the pith is often not in the exact center, and the tree trunk sometimes is more oval shaped than round. Uneven shading by surrounding taller trees, prevaling winds, and localized poor soil can cause tree trunks to be non-round. The tree may be growing at an angle, because the ground has shifted or a taller tree is blocking overhead sunlight. The light conditions may have changed. There may be buried knots where the trunk has grown around former branches. At the base of a fork, there will be twisted and interlocking grain to prevent splitting. The tree may have twisted clockwise and/or counterclockwise as it grew, producing spiral grain. Improper kiln drying also can produce two types of internal stress, known as honeycomb and case hardening. Honeycomb manifests itself as splits inside a board. When a thick board is resawn across its thickness into two narrower boards, case hardening will cause the two pieces to cup towards each other. Yellow pine construction lumber is notorious for having internal stresses. My second workbench top was made using yellow pine because it is strong and inexpensive. For stiffness, a top about 3" thick was desired. 2x4's are spruce/pine/fir whitewood so they wouldn't provide the yellow pine I wanted. I bought a number of 2x8's, which are yellow pine, and rip sawed them lengthwise into two pieces each approximately a 2x4. Almost one quarter of the ripped pieces were too crooked to use because of internal stresses in the boards. The stresses likely were a combination of some that developed in the growing tree and some resulting from rapid kiln drying. Furniture grade lumber seldom has stresses to that extent, but they are occasionally encountered. As a general rule, it might be best simply to discard boards that show significant movement when ripped or resawn. It is easy to recognize that wood in living trees is dynamic - it responds to seasonal changes in its environment and grows. Wood in lumber and furniture, although no longer alive, is also dynamic - it is affected by changes in the amount of moisture or water vapor (water molecules) in surrounding air. Relative humidity is a measure of the amount of water in air at a given temperature. Warm air can hold more water than cold air. The relationship is non-linear (as the temperature increases, air can hold an increasing amount of water) Relative humidity is measured on a scale of 0-100% of the maximum amount of water the air can hold at the given temperature. An average January afternoon in Cincinnati finds the outside temperature about 37 degrees F and the outdoor relative humidity 70%; an average July afternoon in Cincinnati finds the outside temperature about 86 degrees F and the outdoor relative humidity 55%. Outside air migrates into buildings as people enter and leave and through leaks in the building envelope. That infiltrating air is then "conditioned" by the heating and cooling equipment. In January, the infiltrating outside air is heated. If there is no change in the amount of moisture in the air, warming the air lowers the relative humidity. In buildings without supplemental humidifiers, it's not unexpected to find the winter interior relative humidity to be 25% or even less. During the summer, the infiltrating air is cooled. Some of the moisture in the warm infiltrating air condenses on the cooling equipment, removing it from the air; but since lowering the air temperature raises the relative humidity, the two effects offset each other to some extent. In buildings without supplemental dehumidifiers, it's not unexpected to find the summer interior relative humidity to be above 50% in living areas, and higher in crawl spaces and basements. It is said that the US EPA recommends an interior relative humidity in the range of 30-50%, a smaller range than that which likely occurs without winter humidification and summer dehumidification. There is always some water present in lumber and furniture. We think of "air dried" and "kiln dried" wood as being dry, but there is still moisture in the wood. Scientists use special ovens to create moisture-free or oven-dry wood as a reference point. The amount of moisture in lumber and furniture, relative to its oven-dry weight, is called the moisture content and like relative humidity is measured on a scale of 0-100%. The moisture content of wood changes with the relative humidity of the surrounding environment. Wood expands across the grain with increases in moisture content (the amount of moisture in the wood), and shrinks across its grain with decreases in moisture content. Therefore, wood expands across its grain when relative humidity increases, and shrinks across its grain when relative humidity decreases. First, wood's moisture content changes slowly in response to changes in relative humidity - it can take a couple weeks for the moisture content of wood to respond to a change in relative humidity from say 30% to 35%. Second, moisture moves more quickly through end grain than through edge and face grain. Third, some finishes are more impervious to moisture than raw wood, and some finishes more impervious than others. Fourth, moisture content typically is not uniform throughout a piece of wood - often it is lower in the interior than near the outside. Fifth, wood does not expand and shrink equally in all directions with changes in moisture content. The last point is especially important for furniture construction. As wood absorbs water (increasing moisture content) it expands, and as it gives off water (decreasing moisture content) it shrinks. But it does not expand and shrink equally in all directions. The longitudinal direction is a vertical line between the bottom and the top of the tree. From green to oven-dry, on average across all species, wood shrinks about 0.1% longitudinally. This is essentially negligible. The radial direction is a horizontal line from the center of the tree out to the bark. From green to oven-dry, on average across all species, wood shrinks about 4% radially. The tangential direction is a horizonal line that touches the outer edge of a growth ring. (A tangent to a circle is a line that touches the perimeter of the circle at one point.) From green to oven-dry, on average across all species, wood shrinks about 8% tangentially. Seasonal cupping is not the only problem caused by expansion and shrinkage. Firmly join a 12" wide piece of solid wood to a 12" wide piece of plywood during the summer with screws. Plywood does not expand and contract with changes in moisture content. During the winter the solid wood will try to shrink; eventually the screws will shear or be pulled out, or the solid wood will split. Stand a piece of wood on edge across the width of another board (cross grain construction) and glue them together. Almost certainly within a year the glue joint will fail because the one board is stable along its length while the other will expand and shrink across its width. During the summer, firmly join a rectangular tabletop to the four rails of its supporting apron with screws. During the winter the top may split because it tries to shrink and the screws won't allow it to do so. Firmly join with screws a rectangular tabletop to the four rails during the winter, and during the summer the rails around the screws may suffer some crushed wood (making the screws forever loose) or the rail may crack. Make a small table top with a 36" square of plywood. Surround the plywood with a 6" wide border of solid wood, and join the ends of the solid wood with 45 degree miter cuts (i.e. "picture frame" the plywood with the solid wood). Because solid wood does not expand and shrink longitudinally (along its length) the joints between the edges of the solid wood and the edges of the plywood will be fine. But with seasonal expansion the outside end of the miter joints will open; with seasonal shrinkage the inside end of the miter joints will open. A number of the methods described on the Best Traditional Woodworking Practices page deal with the challenges raised by relative humidity and moisture content. The trunks of trees resemble cylinders. Each year, in most species of trees, there is a period of relatively faster increase in diameter in the spring, followed by a period of relatively slower increase in diameter in the summer. 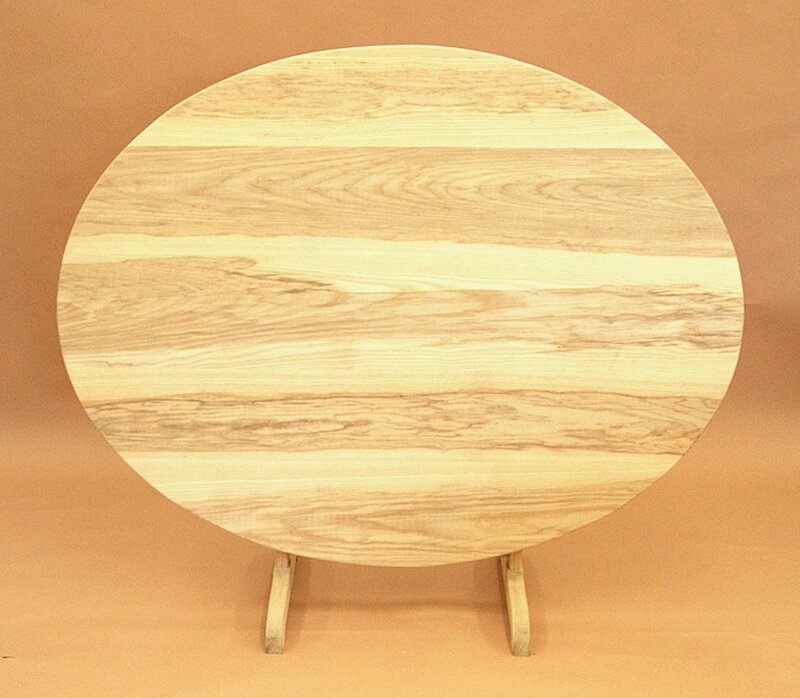 The alternating bands of early and late wood appear as coincentric circles, and create the appearance of grain in boards. This diagram shows several example boards within a log. The coincentric circles are the growth rings. The labeled lines show the two primary directions relative to growth rings. Tangential refers to a board surface more or less parallel to a growth ring. Radial refers to a board surface perpendicular to a growth ring. Flatsawn boards are the most common, with the wide surfaces (faces) tangential to the growth rings. The innermost growth ring on the faces create a pattern often called "arches and cathedrals" or "ovals and ellipses" on those surfaces. The narrow surfaces (edges) may show one to three grain lines running end to end. Flatsawn faces are what one expects a board to look like, because they are by far the most common. Narrow arches and cathedrals add interest and character to a board, but wide ones can be too prominent and distracting. The width of the arches and cathedrals can be different in every board, making a pleasing match of several flatsawn boards in a table top difficult to achieve. 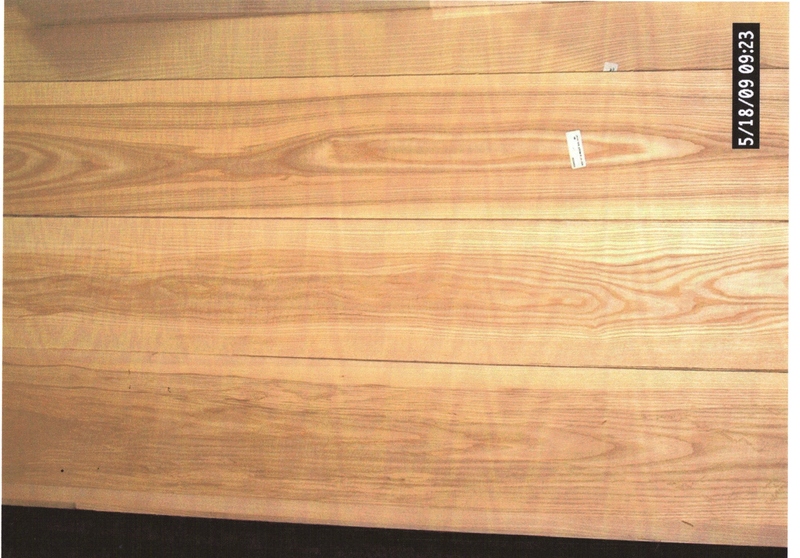 The following picture shows five flatsawn ash boards in an elliptical table top. Arches and cathedrals, sometimes called ovals and ellipses, are prominent in each board. The table is in the style of a French Provincial vineyard table, so a less formal grain pattern seemed appropriate. It may be worth noting that about an hour was spent evaluating the order and surface of each of the boards, and trimming, to achieve a match this pleasing. In the purest definition, quartersawn boards have their wide surfaces (faces) radial to the growth rings. The faces show even parallel lines from end to end. The narrow surfaces (edges) show primarily early or late wood with little or no variation. There is a much greater consistency of grain appearance between quartersawn boards, so a pleasing match of several quartersawn boards in a table top is much more likely than with flatsawn boards. The edges are very bland, and sometimes can suffer grain separation. Riftsawn boards have growth rings diagonal to all four long surfaces (faces and edges). As a result, both the faces and edges show even parallel lines from end to end. Riftsawn boards are ideal for table legs with a square cross section, creating a similar grain appearance on all four surfaces. In this photo,the top board shows very fairly regular straight grain, like quartersawn and riftsawn. The lower three boards all show prominent arches and cathedrals found in flatsawn lumber. In his excellent book Understanding Wood: A Craftsman's Guide to Wood Technology, (2000) R. Bruce Hoadley suggests that most furniture wood is not sawn "through and through" as one might expect. Mr. Hoadley explained that most defects in a log appear at the center. Therefore, mills saw in from one side until reaching defects. The log is then turned 90 degrees and so on. This approach, "sawing around," results in the greatest amount of defect-free lumber. It also explains why one never finds quartersawn hardwood lumber mixed with flatsawn. "Quartersawn and riftsawn" lumber are produced using an entirely different approach. A log is first cut into quarters. Boards are cut off alternating faces of the quarter. They become increasingly narrow, and the grain becomes less quartersawn and more riftsawn. This approach is more time consuming than sawing around, and is not used by all saw mills for all species of wood. Cherry, hard maple, red and white oak, and walnut can sometimes be found quartersawn/riftsawn. Rough lumber still has the rough surface produced by the circular or band saw blade used at the saw mill. One or both edges may have sap wood. The boards are not flat and straight enough to use immediately for furniture. Rough lumber is available in limited thicknesses, such as 4/4 (1"), 5/4 (1 1/4"), 6/4 (1 1/2"), and 8/4 (2"). The green logs are usually sawn 1/8" over the final thickness, to allow for shrinkage that always occurs during drying. For example, a 4/4 board likely was sawn about 1 1/8" thick. Expected demand and common practice determine what thicknesses are available for different species. Hickory and quartersawn/riftsawn sycamore may only be available as 4/4 rough lumber. At the other extreme, hard maple may be available quartersawn/riftsawn in 4/4, 6/4, and 8/4 rough thickness; and flatsawn in 4/4, 5/4, 6/4, 8/4, 12/4, and 16/4 rough thickness. Depending on the opinion of the viewer and where and how they are used, sapwood, tight knots, resin/pitch pockets, angled grain, heartwood, mineral stains, and such may be seen as defects or character. Generally these areas are structurally equivalent to the rest of the board. At one extreme, the maximum width of each board can be used, including any and all sapwood, tight knots, and other "defects," minimizing the amount of wasted wood. However, it would be extremely difficult or impossible under a natural finish to make the resulting combination of boards visually balanced. At the other extreme, every "defect" could be cut out or the entire board rejected. The resulting combination of boards will look very uniform, perhaps too much so, and the amount of wasted wood is high. A third option is to minimize waste, but keep a large inventory of boards to try to find boards with similar defects for each project. This option requires a significant amount of inventory, even more so if small quantities of a variety of projects are made with differing board lengths. A fourth option is to remove only the most visibly prominent "defects" and study the various sequences of boards to obtain a satisfactory combination and ordering of boards. Significant time can be expended studying various sequences of boards, but the amount of culled wood is reduced. The result is more natural, as it reflects the variation found within and between logs. Factory furniture often advertises "rich, dark finishes." Intentionally or unintentionally, the effect is to obscure the grain and figure of the wood. This approach allows the maximum amount of each board to be used, including sapwood. Often the wood is first bleached to make the color of the individual boards as bland and uniform as possible. Next a light penetrating dye is applied to unify the individual boards and begin to restore color. A pigment stain is then applied on top of the wood to begin hiding any "defects" and get close to the desired final color. One or two toning applications and a glazing step add even more color on top of the wood and are followed by clear top coats. The resulting color often is much darker than the natural wood, and obscures almost all the grain and figure of the wood. When one desires to see the grain, character and figure of the wood, there are a number of finishing schedules that can be used. These include hand rubbed finishes such as linseed oil, danish oil, and varnish; waterborne acrylic and pre-catalyzed urethane; and solvent lacquer and precatalyzed. If additional color is desired, an aniline dye penetrates the wood and does not lower clarity; stains are coarser ground pigment particles and sit on top of the wood.